KAGE. Sydney Festival 2014. Carriageworks Bay 17. Jan 16 – 19, 2014. Arts Centre Melbourne Theatres Forcourt. Feb 12 – 16, 2014. Having a forklift in the cast somehow makes you seek more strenuously the meaning of this dance work. 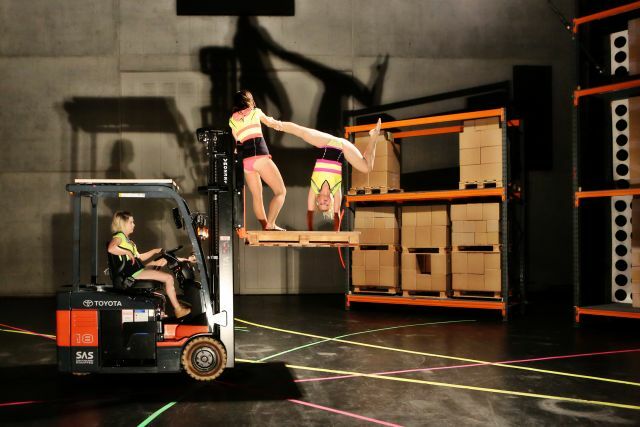 Forklift is a key attraction in the About an Hour season of the Sydney Festival, staged by Melbourne’s dance/physical theatre troupe KAGE, and is well housed in the huge industrial Bay 17 of Carriageworks. It moves to outdoors of the Melbourne Arts Centre in February. A forklift centrestage conjures a workman’s world of common sense; a boy toy, it’s the stuff of childhood imaginings carved out in the dirt. So what’s the story here? In the stripped down warehouse space of Bay 17, this forklift is driven by all three female dancers who expertly spin it on its axis and stack near naked, passive bodies onto huge shelves. The lithe, long-legged dancers also arc sensually across the roof, prongs and cabin of the machine, while the one as driver flips through a girlie magazine – women and heavy machinery are a familiar male cliché but here the women are completely in control. As the soundtrack shifts from distant industrial sounds to a driving minimalist electronic score, the languorous posturing picks up pace a little. Finland’s Henna Kaikula dominates the machine hand-balancing on its roof or by virtuosic contortions around it. Former Circus Oz performer Nicci Wilks is also no slouch. Together, they seduce the initial driver (a nicely droll worker, Amy Macpherson) out of her late night work drudgery – and her safety gear – into a heightened world of physical and mechanised possibility. It’s a seductive show from director and KAGE co-founder Kate Denborough, distinguished by impressive acrobatics and a hefty presence from a forklift expertly manipulated. Maybe it’s a boy thing, but for me the dancers overstretched the languor when the storytelling required a more kinetic explosion of dance energy. Indeed, Forklift would have benefited from a clear dramaturgical input to sharpen the drama around this promising set-up.